Why are Mexicans leaving farm work, and what does this mean for US farmers? Agriculture in North America traditionally has had its comparative advantage in having access to abundant low-skilled labor from Mexico. Around 70% of the United States hired farm workforce is Mexico-born, according to the National Agricultural Worker Survey (NAWS). Fruit, vegetable, and horticultural farms in the US have enjoyed an extended period of farm labor abundance with stable or decreasing real wages. However, new panel data reveal a declining long-term trend in the farm labor supply in rural Mexico. In coming years, US farmers will need to offer higher wages to induce new workers to migrate northward to US farm jobs. Migration within Mexico and to the US increased in the years prior to the recession; however, with the onset of the recession there was a sharp decrease in migration to the US (see Figure 1). The combined shares of the workforce migrating to agriculture either within Mexico or to the US decreased between 2007 and 2010. In contrast, the percentage of the workforce working in the Mexican non-farmwork sector grew steadily. Figure 1. Number of workers that migrate to each sector by survey round. Taylor, J.E., D. Charlton, and A. Yúnez-Naude. 2012. “The End of Farm Labor Abundance.” Applied Economic Perspectives and Policy. 34(4):587-98. Mexico is following the pattern of countries around the world: as its income rises, workers shift out of farm work into other sectors. Mexico’s per-capita income, adjusted for the cost of living, now exceeds $15,000 per year. Growth in Mexico’s non-agricultural employment began before the recession and persists now. As non-farm opportunities increase, the Mexican workforce will continue moving out of agriculture. Why do we see decreases in the supply of Mexican farm labor? The received wisdom in development economics is that the domestic supply of agricultural labor starts out being relatively elastic (i.e., abundant), but the farm labor supply shifts inward and becomes less elastic as countries’ per-capita incomes increase and people shift from farm to nonfarm jobs. In order to induce domestic workers to supply their labor to farm jobs, agricultural wages must rise apace with nonagricultural wages. This is all the more true if non-farm jobs bring non-pecuniary benefits compared to farm jobs and/or workers associate farm jobs with drudgery. Tighter border enforcement and drug-related violence along the border may deter migration, but our analysis suggests that for US agriculture their main effect is largely secondary, reinforcing a negative trend in rural Mexicans’ willingness to do farmwork. 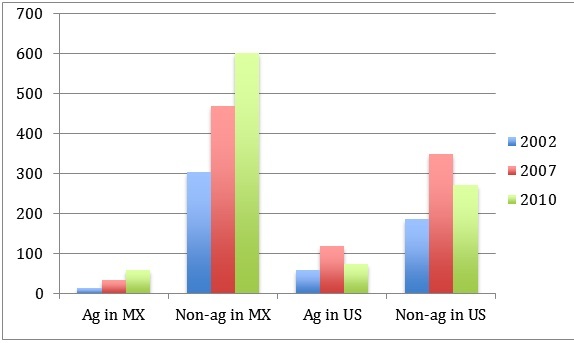 For example, after the “great recession” in 2008, the share of Mexican immigrants working in agriculture decreased more than the share working in non-agriculture. The recession had a large negative impact on construction and service jobs in the non-farm sector while labor demand in the farm sector remained steady and commodity prices rose. If unemployed workers in the non-farm sector sought jobs on US farms during the recession, then one might expect the supply of agricultural labor to increase. Data show that some immigrants did shift from non-farm to farm work after the recession, but more shifted from farm to non-farm in the US. If the decrease in immigration in recent years were the result of increases in border patrol or drug-related violence, then the decrease in farm labor supply should be similar to the decrease in non-farm labor supply, but the data show the opposite. US agriculture appears to be doubly adversely affected by the decline in the supply of immigrant labor and a shift in the Mexican labor supply away from farmwork. A declining farm labor supply in rural Mexico and competition from Mexico’s farmers combine to raise the reservation wage of migrating to the United States—that is, the minimum US farm wage needed to induce new workers to migrate northward to farm jobs. US growers must look for substitute inputs to agricultural production as the supply of agricultural workers is declines. One solution is to seek migrant workers from other countries with lower reservation wages. However, the US-Mexico situation is unique, with two countries at vastly different levels of income sharing a common border. Central American countries are small compared to Mexico and they too are changing. The cost of importing low-skilled labor increases progressively as one looks farther afield, say, to Asia. Consequently, importing agricultural labor into the US from more distant countries does not appear plausible. Another solution is to invest in labor-saving agricultural technologies and transition away from labor-intensive crops. Under this scenario, capital improvements in farm production will increase the marginal product of farm labor, and US farms will change their labor-management practices, hiring fewer workers at higher wages. In the years 2007-2009, 23% of US farmworker families had income below the poverty line (Martin, 2012). Improvements in agricultural production technology are a necessary input to increase farm wages, allowing farmworker families to rise above the poverty line. Simultaneously, rising farm wages create an incentive for farmers to make the necessary investments to raise farmworker productivity. J. Edward Taylor and Diane Charlton are the authors of “The End of Farm Labor Abundance” in the Applied Economic Perspectives and Policy, which is available to read for free for a limited time. Edward Taylor is Professor of Agricultural and Resource Economics and Director of the Center on Rural Economies of the Americas and Pacific Rim (REAP) at the University of California, Davis, where he teaches courses on international development economics and econometric methods. He is also co-editor of the American Journal of Agricultural Economics and founder of the alternative textbook initiative, RebelText.org. Taylor has written extensively on the economy-wide impacts of agricultural and development policies and on immigration. He co-authored Village Economies: The Design, Estimation and Use of Villagewide Economic Models (Cambridge University Press) and Worlds in Motion: Understanding International Migration at the End of the Millenium (Oxford University Press). He is listed in Who’s Who in Economics and has advised a number of foreign governments and international development agencies on matters related to economic development. Diane Charlton is a PhD student in Agricultural and Resource Economics at the University of California, Davis. Her areas of focus are agriculture and international development. Applied Economic Perspectives and Policy aims to present high-quality research in a forum that is informative to a broad audience of agricultural and applied economists, including those both inside and outside academia, and those who are not specialists in the subject matter of the articles. In addition, AEPP publishes specially-commissioned featured articles focusing on the synthesis and integration of applied research and on future research agendas.